As Gor Mahia prepare to take on Young Africans of Tanzania in the 2018 CAF Confederations cup, its worth taking a trip down memory lane to witness and recall Gor Mahia’s first ever sojourn into continental football. Their first ever continental opponents was a club known as Burri Khartoum of Sudan. One player who is easily recognizable is James Sianga who is second in line as the team walks into the field. The players are greeted by The Minister for Cooperatives and Social services, Ronald Ngala. The stadium is packed to the rafters. Many aspects of City stadium have not changed since then. Most notably the residential homes behind the stadium that provide an excellent view into the stadium. And the terraces at Russia have not changed. 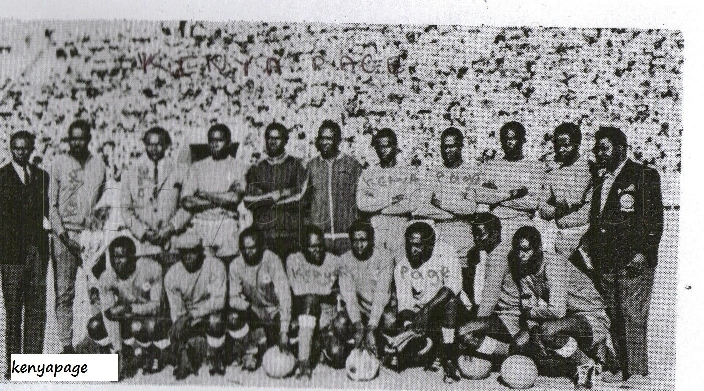 Gor Mahia earned the right to play in the 1969 Africa champions cup by virtue of having won the Kenyan league in 1968, the year of formation of the club. Gor Mahia had been formed in 1968, folding Luo Union FC and Luo Sports club and also recruiting numerous players from Kisumu Hotstars. The local football scene was shambolic in 1969. Minister Ronald Ngala, disbanded the Kenya Football Association and also suspended the national league. Thus Gor Mahia were in danger of lacking match fitness when they played Burri. To mitigate this, they embarked on a countrywide tour to play friendly matches. But Gor Mahia was also undergoing a civil war with certain members of the club executive committee fighting to take over the club and rename it Luo Union FC. The opening round of the 1969 Champions cup were played in September. Gor Mahia won the first leg 4-2 in Khartoum. However in the return leg, Gor Mahia played rather poorly, losing 0-1 at City Stadium in front of a large partisan crowd. It marked the first of many instances where Gor Mahia parlayed an excellent away record. Gor Mahia thus qualified for the next round where they faced off with Ismaily of Egypt. They drew 1-1 at home before losing 1-3 in Cairo. Ismaily went on to win the Africa champions cup in 1969. Among the players who featured for Gor Mahia in this campaign were James Sianga, John Otieno “Hatari”, Josphat Okello “Smart”, William Ouma “Chege”, Arthur Omondi, Paul Ndula, Samson Odore, Joseph “Mwalimu” Okeyo, Walter Molo, Steve “McQueen” Yongo, Daniel Nicodemus Arudhi, John Wambudo and Chris Obure, the former senator of Kisii county. They were coached by Paul Odhiambo, the first ever coach at the club. Gor Mahia’s first continental campaign was creditable considering what the club had to overcome which included the lack of a domestic league, infighting within the club an infighting at national level which led to the disbandment of both the KFA and the league. It is also said that players were significantly affected by the death of Tom Mboya who had been buried in an emotional ceremony only weeks earlier.